El Rey Effects Mystic Ouija Fuzz Review – Best Fuzz/Distortion Pedal? I’ve been really intrigued by El Rey Effects lately. James and Co. have a passion for creating great high-quality boutique effects that are within reach of guitarists on a budget. And the cool supernatural styling of their latest offerings, the Mystic Ouija Fuzz and Fuzz de la Muerte, adds to the unique vibe and growing reputation of their distinguished repertoire of guitar pedals. The Mystic Ouija fuzz promises to span the range of overdrive to fuzz distortion and features LED and diode clipping options to augment the massive amounts of gain on tap. But how does it sound? Is it the best fuzz/distortion pedal around? You’ll find out in our El Rey Effects Mystic Ouija Fuzz review. Here’s a quick rundown of the features of the pedal before we consult the oracle of fuzz. “Yes” control knob adjusts fuzz level. Low settings produce slightly overdriven sounds. Clockwise settings produce more intense fuzz effects. Center control knob adjusts the tone of the fuzz. Lower settings deliver more bass response. Clockwise settings produce tones with more treble. “No” control knob adjusts overall output volume. 3-way selector switch adjusts the clipping of the fuzz between asymmetrical diode clipping (top), symmetrical diode clipping (middle), and asymmetrical LED clipping (bottom). True bypass footswitch allows signal to pass unaffected when disengaged. Powered by 9-volt battery or 9VDC power adapter. Visit El Rey Effects for more info about the Mystic Ouija Fuzz. The El Rey Effects Mystic Ouija Fuzz is one of those pedals that blurs distinction. Similar to how the Pro Co Rat2 and Electro Harmonix Big Muff Pi have a character that’s somewhere between fuzz and distortion, the Mystic Ouija Fuzz follows suit. This pedal has a voice that’s quite unique from most fuzz pedals. Considering this pedal’s standout appearance, it’s fitting that the Mystic Ouija Fuzz would boast tones that set it apart from the crowded market of fuzz and distortion pedals. The 3-way selector switch up by the moon provides a basis for affecting the initial tone and response of the pedal. I find that the top-most position, asymmetrical diode clipping, produces a bigger, more open response. The middle symmetrical diode clipping option, while sometimes hard to discern from the top setting, provides a subtle variation from the top setting. The bottom-most position alters the sound of the pedal with asymmetrical LED clipping, resulting in a more focused fuzz tone. The LED clipping drops the volume a bit, so a slight increase in output (“No”) is necessary to compensate. The LED and diode clipping options are equally usable and which setting is best is subject to individual guitarists’ tastes. Since they all sound great, you’ll probably find yourself preferring one setting and going back to another later. At the lowest fuzz settings the Mystic Ouija Fuzz still produces a hefty amount of overdrive tone to give your guitar sound some muscle. It’s definitely a step up from mild overdrive and has a distinctive coloring that will augment your tone in interesting ways. For the school of guitarists that appreciates how an overdrive with its own unique voice can compliment your tone, the Mystic Ouija Fuzz serves up some very enticing tones worth exploring. The center tone control serves the most in affecting your sound, and a setting somewhere in the 10 o’clock to 2 o’clock range will cover a wide range of sounds for most purposes. Bringing up the “Yes” knob just a little wakes up the pedal with a brighter, grittier top end. From about 8 o’clock all the way to 3 o’clock, the distortion increases evenly and gradually. 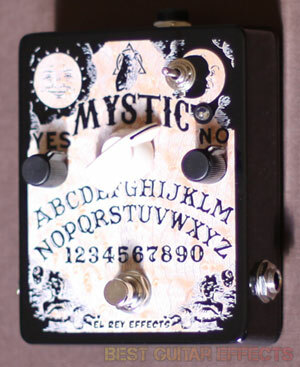 At moderate “Yes” settings the Mystic Ouija Fuzz produces a pleasing distorted saturation that has a hint of fuzzy roundness to the sound. The top-end cuts through with refined note definition for a distortion sound that’s great for tight riff stabs. The bottom end also has a softer, spongier feel that’ll be at home in “doomier” styles of heavy fuzz riffage. While I typically prefer a more percussive low end, something about the Mystic Ouija Fuzz’s slightly loose bottom just works. 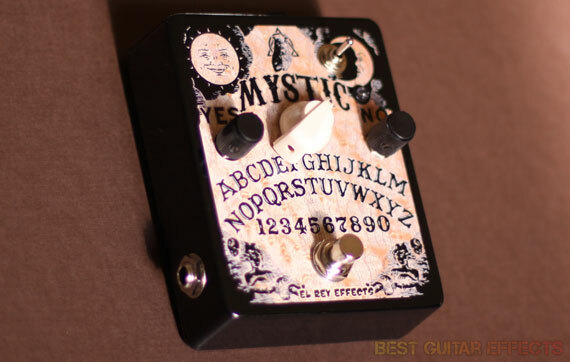 Whether used on it’s own as your sole fuzz/distortion pedal or layered on a recording with other dirt sounds, the Mystic Ouija Fuzz offers some seriously good tones here that can be used in all kinds of settings. Cranking the fuzz by diming the “Yes” knob brings in the full wrath of this pedal. The Mystic Ouija Fuzz summons an aggressive fuzz distortion sound from beyond the world of the living, infusing your tone with a supernatural distortion sound like no other. With all the flavors of distortion and fuzz out there, it’s refreshing to discover a pedal every now and then that really offers something a little different from the standard fare. The noise floor comes up a little on the highest gain settings, but you’ll be rocking the Mystic too hard to notice. And again, the 3-way switch will let you open up the sound with the diode clipping settings or sharpen your tone a bit with the LED clipping. El Rey Effects did a real fine job with this one. The Mystic Ouija Fuzz already had a good thing going with its superstition-inducing design, but I’m very happy to report that this pedal really delivers where it counts most in the sound department. It also happens to be one of my personal favorite distortion pedals. Let’s see the final result. The El Rey Effects Mystic Ouija Fuzz stands apart from other distortion pedals with a unique fuzz/distortion voicing all its own. Not to mention this pedal will certainly draw some attention with curious looks at your pedalboard thanks to its cool ouija board graphics. The versatility of this pedal lies in its wide range of gain sensitivity and excellent sweeping tone control that’ll help you find the perfect fuzz sound for your mix. An assortment of clipping options rounds out the sounds of this great sounding yet easy to use pedal. Looking for the best fuzz/distortion pedal? Consult the Mystic Ouija Fuzz for the answer if you dare. That concludes our El Rey Effects Mystic Ouija Fuzz review. Thanks for reading. 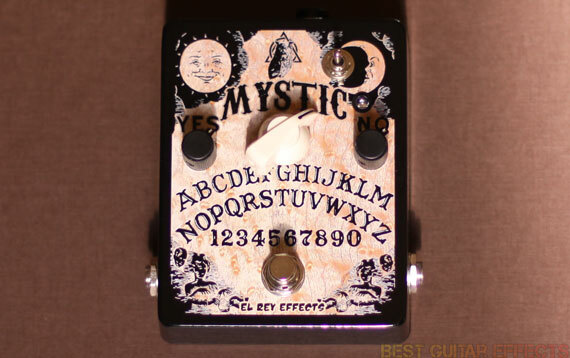 Want to buy the El Rey Effects Mystic Ouija Fuzz? Do you have anyy ideas to help fix this problem?